Ask most adults who played youth sports if their experience taught them something about life, and the answer will be a definitive “Yes!” And we have coaches to thank for that. Coaches are some of the most important people in the lives of children and young adults. The best coaches teach discipline, caring, teamwork, responsibility, physical fitness, dependability, and so much more. They build our youth up, they celebrate our kids’ wins and salve our kids’ losses, both on the playing field and in life. They are friends, leaders, mentors and caregivers. At TeamSnap, we think youth sports coaches are truly some of the most important people in the world. It’s why we are grateful for the coaches we had, the coaches our kids currently have and, in some cases, the coaches we are. 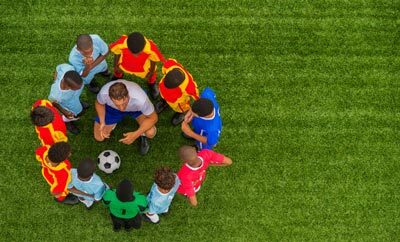 It’s also why we decided to sponsor the Positive Coaching Alliance’s Double-Goal Coach® Award, one of the highest honors a U.S. youth sports coach can receive. The Positive Coaching Alliance (PCA), a national non-profit built developing “Better Athletes, Better People,” works to provide all youth and high school athletes a positive, character-building youth sports experience, and that’s a mission TeamSnap supports fully. Take a look at this video featuring one of last year’s winners — shown at the PCA event, where he accepted his award for a glimpse at the kind of exemplary coach the PCA Double-Goal Coach® Award honors, then consider nominating an inspirational coach you know. This will be the Double-Goal Coach® Award’s 14th year. Each year PCA selects and publicizes 75 finalists from across the United States. The 25 winners of this prestigious national award receive $250; a trophy; recognition in PCA’s website, newsletters and media campaigns; and the chance to accept the honor in California during PCA’s National Youth Sports Awards Dinner and Auction Presented by TeamSnap. The schools and organizations that the award-winning coaches serve receive national publicity from the award, which also provides the opportunity to hold the coach up as a great example for other coaches to emulate. The deadline to nominate a coach is Dec. 31, 2014. Please take a few minutes now to nominate a special coach in your life and pass along the word to others. Let’s celebrate our coaches; they deserve it!